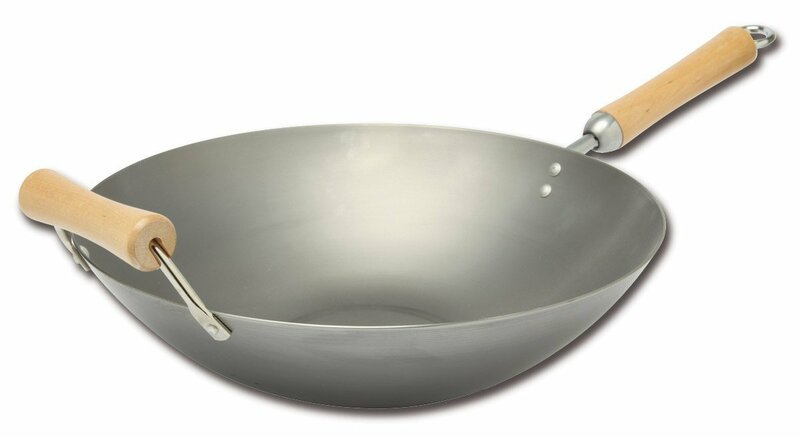 Part of the Classic Series by Joyce Chen, the 14" Flat Bottom Wok is theperfect combination of size, features and function. The natural carbon steelsurface duplicates a more authentic wok cooking surface - seasoning isrequired. These sturdy carbon steel pans will deliver excellent cookingperformance and feature a long Birch wood handle and side helper handle foreasy lifting. The handles are designed to stay cool on the stovetop, so youcan easily remove the pan from the burner without using potholders. Its curvedsides diffuse heat and extend the cooking surface, which helps with tossingand stirring. The great depth allows ample room to cook a whole fish, if sodesired. Simmering, deep frying, or steaming, are just a few of its multipleuses. Joyce Chen's slogan "Eastern Cookware for the Western Kitchen," reflectsher focus on providing high-quality, versatile tools and products that haveAsian flair, but can be used in a western kitchen. Today, Joyce Chen Productscome from all over the Pacific Rim to bring the best of Asia to you. JoyceChen opened her first restaurant in Cambridge, Massachusetts in 1958. Therestaurant flourished, and in 1973 a larger Cambridge restaurant was opened.Chen also began writing Chinese cookbooks and in the 1970s began hosting acooking show on public television. She found that the selection and quality ofChinese cookware in America didn't live up to her high standards so shedeveloped her own.